The advantages of the Imorgon Ultrasound Enhancement System™ extend far beyond the exam room. Ultimately the system’s diagnostic accuracy, reliability and efficiency benefit a wide range of stakeholders throughout your healthcare organization. Patients—experience enhanced safety and satisfaction through more precise, accurate and error-free reports that frequently are completed more quickly. Sonographers—are able to improve the quality of studies, while also performing exams more efficiently, smoothly and with less effort. 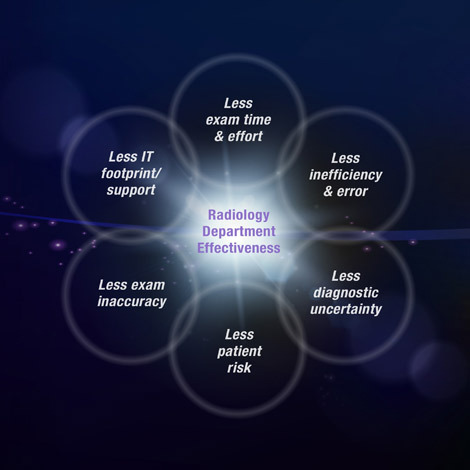 Radiologists—achieve greater diagnostic confidence and improved workflow efficiencies, leading to a more gratifying professional experience with diagnostic ultrasound. Referring Physicians—know their patients are receiving the most accurate, efficient ultrasound studies—and that reports are more informative and accurate. IT Managers—experience reduced time, cost and effort in supporting ultrasound. Health Care Executives—gain quantifiable support in achieving the seemingly contradictory goals of slashing per-capita costs, while improving quality of care and the overall patient experience.